First published in Dutch as Het duister dat ons scheidt by Contact in the Netherlands in 2003. English language translation by Hester Velmans published in the UK by World Editions International in April 2015. The Darkness That Divides Us is written in three sections which chart the growing up of Lucy. The first section is narrated by an unknown preschool child and enables to see Lucy from the outside, so to speak. The second and third sections are narrated by Lucy herself when she is twelve years old and when she turns eighteen. I loved that the sentiments and understanding of each section is appropriate to the age at which Lucy is depicted, although the language used is adult, of course. This allowed me to see Lucy as the child she should have been even though the events that occurred when she was just six years old pushed her, in some respects, into a maturity beyond her years. Dorrestein has a brilliant understanding of the pack mentality of young children, especially their spite and their lack of awareness of the potential consequences of their actions. She also vividly portrays Lucy's loneliness and her internalising of blame which should have been apportioned to the adults around her. In the first section we get a wonderful view of the shiny new housing estate in which Lucy's unorthodox family setup is initially a central focus, but soon becomes the focus for blame as every other family turns against them in the aftermath of the murder. In order to preserve their own self-justification, we see the mothers tutting over Lucy's apparent neglect yet without any one of them stepping out of their self-imposed lines to help her. Instead the bullying attitudes of the children are reinforced by their parents' behaviour towards this Otherness that they perceive as a threat. All the time, as readers, we don't know the truth of what has occurred and have only a child's understanding of the adults' half-hidden conversations. This makes for a tensely gripping novel that I could hardly bear to set aside for a minute! I did fear that removing Lucy and her household from this hothouse would destroy Dorrestein's perfectly rendered atmosphere, but in fact the claustrophobia of the tiny Hebridean community they join contrasts gorgeously with her descriptions of the wild windswept island. The story changes as Lucy's advanced age allows her to pick up more clues from what her mother and 'uncles' avoid saying which, in turn, enabled me to stretch my ideas of What Really Happened. 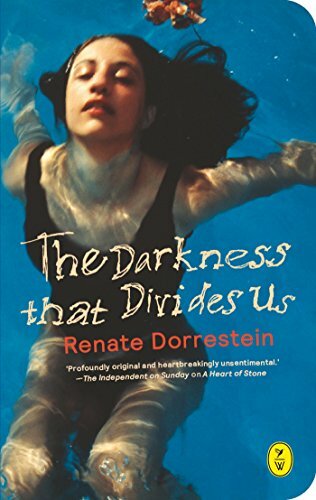 That Dorrestein could keep me guessing right to the end made The Darkness That Divides Us a truly compelling novel. I loved its insightful portrayal of different human relationships and the deceptive lengths people will go to in the belief that they are protecting their loved ones - even though the result of such protection may well be more damaging than if honesty had prevailed from the start. World Editions have some really interesting titles. This sounds intriguing - and a beautiful cover too. That's different that the first section was narrated by an unknown narrator, but in a way, maybe that makes sense? Like you said, children don't have as much awareness of their own actions, so maybe looking in from the outside can more accurately show her actions. Idk. The mystery element and all that sounds interesting though! oh I'm such a sucker for anything with the word "darkness" in the title. I think this is a GREAT title! Of course I'm super curious about the ‘uncles’ !!! I think that changing the character voice as she ages is a hard thing to do! How interesting and the different perspectives have me intrigued. Oh yay, a Dutch village? I feel like it is so hard to find books set in the Netherlands or just with any mention of it, so I always hop on books set there. It sounds like this one was a great read too and that the author really knows how to set the atmosphere. I hoped you would spot this one! For such a literary nation, Dutch books are difficult to find - in English translation anyway!